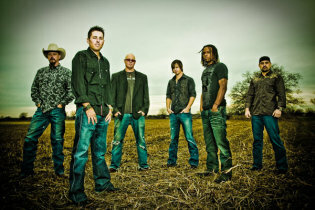 Discussions Magazine Music Blog: CASEY DONAHEW BAND/Standoff: Available April 16th! On tour NOW! CASEY DONAHEW BAND/Standoff: Available April 16th! On tour NOW! Burleson, TX native, Casey Donahew, has carved out an impressive niche for himself on the country music scene. Casey’s solid base of loyal fans flock to his legendary live shows. Building his career from the ground up, one show at a time, the Casey Donahew Band has performed on countless stages night after night until they achieved sold out status at just about every venue they play. They’ve notched seven #1 hits on the Texas Music Chart, recorded four independent albums to critical acclaim, and Donahew’s 2011 Double Wide Dream debuted #10 on Billboards Country Album Chart. Donahew’s efforts have pushed him to heights he never could have imagined when he first plugged in at the Thirsty Armadillo in the Stockyards of Ft. Worth in 2002. Now 10 years in, Casey has constructed his own field of dreams. Donahew’s last studio album has sold over 42,000 albums – Career album sales over 160,000 and track sales over 300,000.